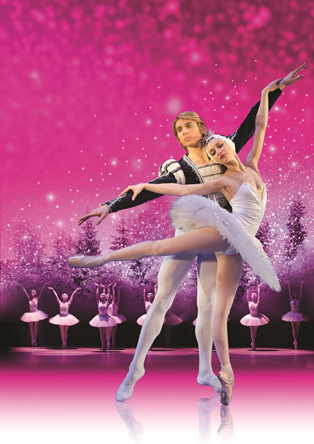 St David’s Hall Tuesday 20 December – Monday 2 January La Fille Mal Gardée, The Nutcracker & Swan Lake! La Fille Mal Gardée was the creation of Jean Dauberval, one of the greatest choreographers of his day. Legend has it that Dauberval found his inspiration for the ballet whilst in a Bordeaux print shop where he saw a Pierre-Antoine Baudouin painting. It showed a girl in tears being reprimanded by her mother, whilst her lover scurries away in the background. This charming story of a couple in the throes of young love and their increasingly inventive ways to avoid her watchful mother remains one of the most captivating tales in ballet. Despite its French title, La Fille Mal Gardée is emphatically English in theme and is inspired by a love for the Suffolk countryside. With its exuberant good humour and delightful pastoral wit, you’ll love its folky choreography derived from Lancashire clog and maypole dances. It’s the season of goodwill and St David’s Hall would like to spread the festive cheer with great prices for the whole family to enjoy our Christmas ballets! Children’s tickets for Under 16s are 50% off all performances, starting at just £7.50* for matinees and £8.25* for late afternoon and early evening performances. We can also offer an amazingly good value deal for two adults and two children under 16 to attend any matinee with fees starting at only £41*, and just £46* for any of the later shows. *A £3.95 Ticket Service Charge applies per transaction for all performances, plus an optional 95p postage fee.